McFadyen Group - McFadyen is a pipeline construction business based in Queensland. We offer plant hire in Brisbane and other areas in Australia. 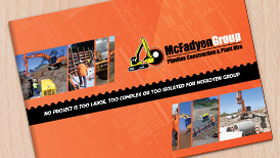 If you need Plant Hire Brisbane, have you seen what McFadyen Group has to offer? We offer pipeline construction and plant hire. We know that reputation is everything in this industry, which is why we only work with skilled professionals and all of our equipment is sourced from leaders in the industry. We believe this is important to all construction because it is the only way to guarantee an effectively finished project. We specialise in construction of large scale pipeline for private projects, as well as government projects. We have a lot of experience in what we do.If you are curious about what we can offer you, consider checking out our About Us page which goes into a lot of detail about who we are. We take our reputation very seriously and it is an important part of our business philosophy. If you need to hire equipment immediately, check out the Our Services tab, which offers pages detailing the various services that we can offer you immediately. Here you will find all of the information that you need to get started on a new project right away. If you would like to contact us for more information regarding our services or for a quote, please feel free to reach out to us by phone or email. We look forward to working with you in the future.